Corezone Monthly Newsletter: November 2016 – River Crossing Basics, The Buff® Cap Pro, Safeguarding your new RFID Credit Cards and our Monthly Promotions. 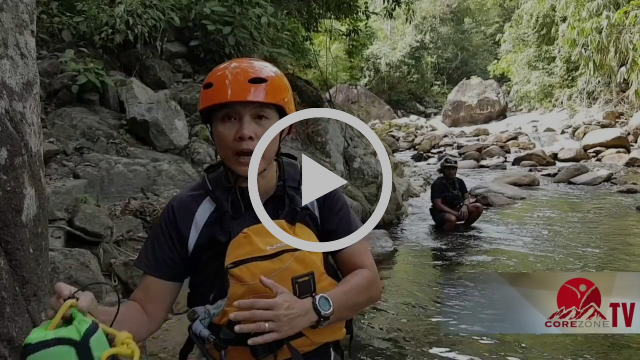 Chan Yuen Li, a certified Instructor by Rescue 3 International will show us how to safely cross a river. We’ve also included two articles about the recent river swell which resulted in 128 trapped victims. We urge our readers to be mindful and make objective decisions when in the wild. KUALA KUBU BAHRU: Seramai 238 pendaki termasuk 10 kanak-kanak yang terkandas akibat fenomena kepala air di Bukit Kutu, dekat sini selamat dibawa turun kira-kira pukul 2 pagi tadi. KUALA KUBU BHARU: Dua remaja lelaki menempuh saat mendebarkan apabila terperangkap di atas batu besar lebih sejam di tengah-tengah air terjun apabila tiba-tiba berlaku kepala air ketika berkelah di Air Terjun Pertak, di sini, petang tadi. The BUFF® Cap Pro is made out of Fast Wick Extra Plus material which makes it ideal for activities in hot weather. It is also ultra light (36g) and ultra thin (fits nicely under any helmet). It is washable and has the Silver+ Anti Odour treatment. Also provides UPF50+ protection (98% UV blockage). Corezone is now having a 10% discount* for all BUFF® Cap Pros. Last month we featured the Sea To Summit Travel Wallet RFID. Check out the link below find out more about the Sea To Summit Travel Light Neck Wallet RFID. Come take a tour of our store and see what we have. Check us out virtually before coming in physically. Don’t forget to give us a rating when you’re done. Help us make room for more awesome stuff.